Saturn is an amplifier family that can be used as an ambulatory amplifier or as a small lab amplifier. 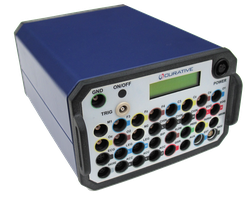 The Saturn amplifier is available in a 22 or a 38 channel version for full polysomnography or polygraphy recording. A separate DC-input box is available as an option. The amplifier can be connected to a pc with a bi-directional optical fiber cable. For ambulatory use the amplifier can be powered by batteries and the data is written on an SD-card. The data from the SD-card can be imported in Galaxy for further analysis. The Saturn amplifiers are true DC amplifiers, making it possible to study slow EEG oscillations from zero Hertz. Flexibility in channels for EEG/EOG/EMG, ECG, respiration, etc.